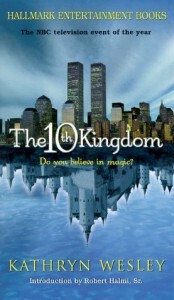 The 10th Kingdom is book that is tied to a tv movie that aired in the USA in 2000, under the same name. It is retelling of some fairy tales and what happens after ever after. Probably one of stories that started landslide of retelling of fairy tale movies and books. I had seen the movie that this book is based on. I love it. I thought the book was going add on to the story or continuation of it. It did not, it is basically a rewrite of the movie but done really well. Since it has been 17 years (Wow!) since the movie aired I pretty much forgot a lot of the movie, so it was like a new story. Still enjoyed it. I also loved that there were pictures of characters in the movie which made it easier to picture the actor as the characters. Love the characters Virginia and Wolf. At first I did not like them as a couple but they grow on you. I still feel there should be more after the story and wish it was a series. I liked the stories behind the 10th Kingdoms but I do not think we will get more. It’s not the best retelling of fairy tale but it is fun and worthwhile to read or watch if you rather. I really wish NBC would do more movies like this that they did in the early 2000’s. They were bright, colorful and fanciful. Just my kind of fantasy telling.